Silver Roman radiate of Gordian III, dating to c. 238 - 244 AD. 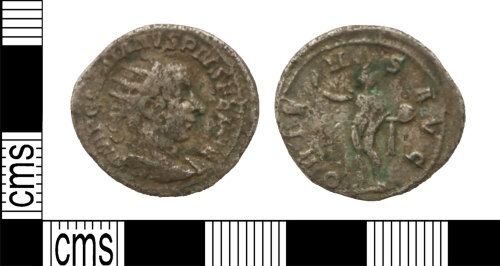 Obverse of right-facing cuirassed and radiate bust; IMP GORDIANVS PIVS FEL AVG. Reverse of Sol standing facing, raising hand and holding globe; ORIENS AVG. The coin is 22.76mm in diameter, 1.72mm in thickness and weighs 3.32g. Roman silvered radiate, probably Gordian III? 238 - 244 AD. Reverse type probably ORIENS AVG, Sol with raised hand and globe.